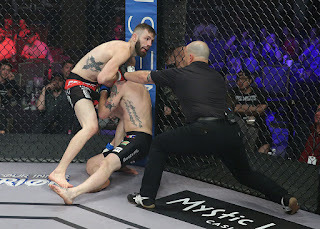 Legacy Fighting Alliance lightweight contender Thiago Moises (10-2) scored the fifth submission of the night on AXS TV FIGHTS: LFA 41 tonight, tapping out Jeff Peterson (9-5) with a guillotine choke in the second round. Also, another must-see highlight from the night, Nate Jennerman (12-3) caught Kevin Croom (18-9) in a standing guillotine choke only 48 seconds into the first round, winning by technical submission. Co-Main Event - Lightweight Fight - Killys Mota (11-0) submitted Bobby Lee (8-2) with a guillotine choke at 0:21 in round two. Featherweight Fight - Nate Jennerman (12-3) caught Kevin Croom (18-9) in a standing guillotine choke to win via technical submission at 0:48 in round one. Welterweight Fight - Ben Neumann (13-5) outlasted Bobby Cooper (13-8) to win by unanimous decision (29-28, 29-28, 29-28). Catchweight Fight (150 pounds) - Jordan Griffin (16-5) submitted Shawn West (15-10, 1 NC) with a neck crank at 4:52 in round one. Middleweight Fight - Tim Hiley (7-0) defeated Tyler Vogel (8-4) via unanimous decision (30-27, 30-27, 30-27). Heavyweight Fight - Calyn Hull (4-0) submitted Ryan Debelak (5-3) with an arm triangle at 1:59 in round two.